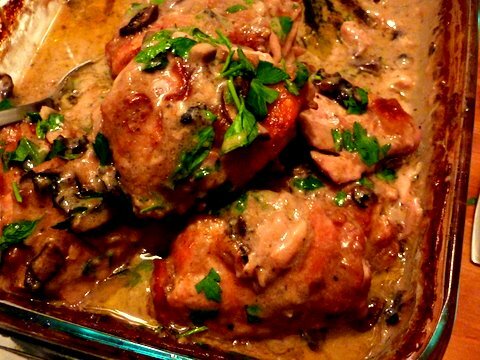 a cold, rainy night calls for a certain kind of dinner & this chicken fits the bill – rich & creamy, simple & familiar. i am a fan of one-pot meals & love pulling a bubbling dish from the oven that can go directly to the table-directly to my plate-directly to my mouth. yum. this recipe comes from my aunt, who is a fabulous cook, & it is a dish she has been making for decades. the fresh mushrooms are my addition – i like the added texture & deepened flavor. and don’t skimp on the parsley! it brightens the whole dish. have i mentioned that i am a child of the 70’s? season chicken with salt, pepper & poultry seasoning and place skin side down in roasting pan. 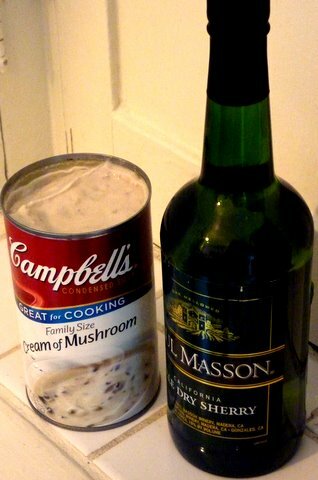 combine mushroom soup, sherry & chicken broth in a sauce pan, bring to a boil. stir in garlic & mushrooms. pour sauce over chicken. bake chicken for 45 minutes. remove from oven, turn chicken pieces over (skin side up), baste with sauce & return to oven for 1 hour, or until meat is very tender. scatter parsley on top, stirring some into the sauce. *i prefer dark meat but white will work, just be sure to shorten the cooking time as it cooks more quickly and has a tendency to dry out. ← it’s easy being green. I also remember making this often when you were little….brings back sweet and tasty memories. Thank you, Loretta, and long live Campbell’s mushroom soup! made it tonight – had to use boneless, skinless thighs as that what was in the fridge, but it was super yum just the same. I just shortened the cooking time by 15 minutes. And I, too, had many-a-cream of mushroon soup concoction growing up!